Loneliness is a universal thing that affects us all. It can happen when we least expect or when we isolate ourselves from others. 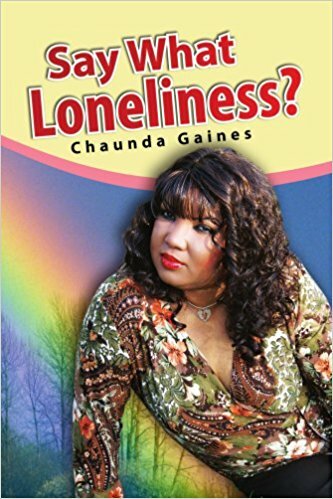 Having experienced loneliness, author Chaunda Gaines reveals her thoughts and suggestions that can help you with the release of her new book Say What Loneliness? This book is an inspirational guide written to help you find out where loneliness fits into your life. It can inspire you to determine if you can make your life better than what it is or even find new directions whenever you feel lost, lonely and clueless. If you know someone feeling really lonely, buy this book for them. Start making a difference with this engaging book today! Chaunda grew up in Third Ward, Texas. She’s half Hispanic. She graduated from Marion High School in Houston, Texas. She has worked in the insurance industry for twenty-three years. She always had a dream of becoming a writer from the very age of sixteen. She grew up finding about life the hard way. She had nobody to tell her about life problems you experience, the outcome of decisions and choices you make that can scar you for life. This is what aspired her to write to help others. She writes using discernment guided by divine inspiration. When she is writing she can zone herself in that element thinking how you as an individual can be thinking inside your mind. She has gone through many hardships, heartaches, failed relationships, failed marriages and many storms in her life. Her writings are real, simple and plain. Her book is about how loneliness can effect the behavior pattern of an individual life. The outcome of loneliness creeping inside your soul could result in erratic behavior. Which could have you making bad decisions or choices in your life which can end up hurting you. There are twenty topics in this book short and precise which deals with real life issues in our everyday life. In each topic, there is an solution to how you can make your life better than it is to continue moving forward in your life and not going backwards when loneliness is present. She hopes you enjoy reading “Say What? Loneliness.